Security cameras in Denver and the Metro Area are offered through Colorado Security Products , Inc. When you want to protect your home or business, the old adage is true: a picture is worth a thousand words. There is no better way to document activity inside or outside your home or business than with a visual record that recreates past events or even shows them live. At Colorado Security Products, Inc, we offer an assortment of full color and black and white cameras, indoor/outdoor cameras, covert, infrared and wireless cameras. No matter what your needs, our staff will work with you to find the video technology that best meets the level of security you desire. Our Digital Video Recorders (DVR) and Network Video Recorders (NVR) are the standard for law enforcement and government agencies, corporate installations, and school districts worldwide. If you have a large estate, you might be interested in this type of surveillance cameras set up. With DVR and NVR systems, you can have multiple screens to assure broader coverage, with cameras assigned to smaller areas. Multiple alert view windows can be assigned to a video grid for receiving video either via alert or on demand. Systems can have other useful features such as carousel display, alert view, video on alarm, and hotspot functionalities. Just as you see on TV when the police officers review surveillance footage, you can review archived video by your security camera in Denver, time or dates, or when motion was detected. If you are trying to investigate an occurrence, such as the theft of laptop, you can zero in on where the laptop was located. From there, your DVR or NVR will zero in on suspicious motion in the nearby area and the system will discover actual evidence in a few clicks. You can incorporate a useful video segment into an AVI file that can be viewed on a computer, or export an encrypted, password-protected video file. To make sure that your security cameras are current with all the latest features, you can invest in software upgrades, which reduce the need for additional hardware purchases and will protect your investment long term. If you need IP remote access, we can offer you a number of options. Whether you are a law enforcement officer doing surveillance from an unmarked van or a concerned parent checking on the babysitter, we have a system for you. Options include WiFi and smartphone cellular-enabled portable clients, where you have access to both recorded and live video, complete with full pan-tilt-zoom (PTZ) control. Outfitted with an optional virtual video matrix switch, you can send a video stream to any PC screen or monitor, on or off premises. To protect your videos from unauthorized viewing, remote access solutions have a multi-tiered access authorization scheme, which allows you to restrict or assign permissions by camera, function, or person. 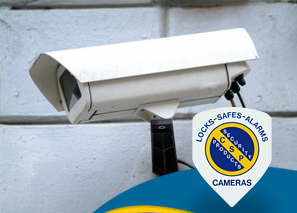 Contact us today at (303) 756-1000 to discuss your needs for security cameras in Denver or the Metro Area.